Soaked in the fantasy world of H.P. Lovecraft, Cephalectomy plays mystigrind. Mystical lyrics are chaotically delivered in layers of insane voices, and super-imposed over a soundtrack of metal ferosity that's dripping with cheese. The band manages to mix extreme death metal with melodic Scandinavian metal and a touch of power metal riffing to create a sound that is truly unique. 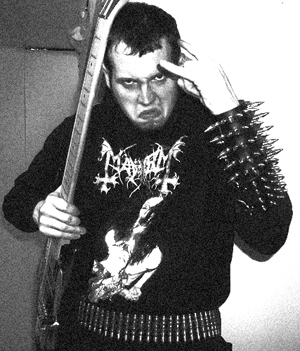 Even more incredible is the fact that Cephalectomy's music is written and executed by one man -- Corey Andrews. Andrews enlists the help of master bard Jason Nichols to craft the sinister storylines and to articulate each word as only he can. Discorporate Music signed the Cephalectomy on the strength of the material on their Dark Waters Rise demo released in 1998. Cephalectomy continues the punishment with their new EP The Dream Cycle Mythos. Clocking in at 23 minutes and 8 seconds, The Dream Cycle Mythos takes the listener on a voyage into other dimensions as one man's mental illness brings him face to face with horrid visions from the darkest recesses of his mind. His suffering provides an interesting case-study for a team of psychiatrists monitoring his behavior and a backdrop for entertainment for the rest of us. This epic, single-song release will no doubt become a sought-after commodity for experienced fans of death/grind metal. There is nothing average, routine or expected on The Dream Cycle Mythos. It is truly a work of extreme art. *Cover art courtesy of The Goomi Studio.